Junglerice (Echinochloa colona) is a monocot weed in the Poaceae family. In Costa Rica this weed first evolved multiple resistance (to 2 herbicide sites of action) in 2013 and infests Rice. Multiple resistance has evolved to herbicides in the Groups A/1, and B/2. These particular biotypes are known to have resistance to bispyribac-sodium, cyhalofop-butyl, imazapic, and imazapyr and they may be cross-resistant to other herbicides in the Groups A/1, and B/2. Greenhouse, and Laboratory trials comparing a known susceptible Junglerice biotype with this Junglerice biotype have been used to confirm resistance. For further information on the tests conducted please contact the local weed scientists that provided this information. There is no record of differences in fitness or competitiveness of these resistant biotypes when compared to that of normal susceptible biotypes. If you have any information pertaining to the fitness of multiple resistant Junglerice from Costa Rica please update the database. The Herbicide Resistance Action Committee, The Weed Science Society of America, and weed scientists in Costa Rica have been instrumental in providing you this information. Particular thanks is given to Bernal Valverde for providing detailed information. Han, H., Q. Yu, M. Widderick, and S. Powles. 2015. Target-site EPSPS Pro-106 mutations: sufficient to endow glyphosate resistance in polyploid Echinochloa colona?. Pest Management Science : . This study confirms and characterises glyphosate resistance in two polyploid Echinochloa colona populations from north-eastern Australia. Glyphosate dose response revealed that the two resistant populations were marginally (up to 2-fold) resistant to glyphosate. Resistant plants did not differ in non-target-site foliar uptake and translocation of 14C-glyphosate but contained the known target-site EPSPS mutation Pro-106-Thr and/or Pro-106-Leu. Although plants carrying either a single or two EPSPS mutations were glyphosate-resistant relative to the susceptible population, they were still controlled at the field rate of glyphosate (450 g a.e. ha−1) when treated under warm conditions (25/20 °C). However, when treated in hot conditions (35/30 °C), most mutant resistant plants (68%) can survive the field rate, and an increase (2.5 fold) in glyphosate LD50 was found for both the R and S populations. This study shows that one or two EPSPS Pro-106 mutations are insufficient in conferring field-rate glyphosate resistance in polyploidy E. colona at mild temperatures. However, control of these mutant plants at the glyphosate field rate is poor at high temperatures, likely due to reduced glyphosate efficacy. Therefore, glyphosate should be applied during relatively mild (warm) temperature periods in the summer growing season to improve E. colona control. Rocío Alarcón-Reverte, Alejandro García, Susan B Watson, Ibrahim Abdallah, Sebastián Sabaté, María J Hernández, Franck E Dayan and Albert J Fischer. 2014. Concerted action of target-site mutations and high EPSPS activity in glyphosate-resistant junglerice (Echinochloa colona) from California. Pest Management Science : . 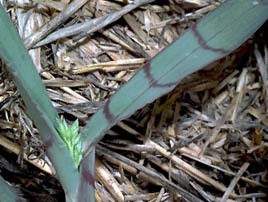 BACKGROUND: Echinochloa colona is an annual weed affecting field crops and orchards in California. An E. colona population carrying a mutation in the EPSPS gene endowing resistance to glyphosate, the most widely used non-selective herbicide, was recently identified in the Northern Sacramento Valley of California. Plants from this population, from a suspected glyphosate-resistant (GR) population, and from one susceptible (S) population collected in the Northern Sacramento Valley of California, were used to generate three GR and one S selfed lines to study possible mechanisms involved in glyphosate resistance. RESULTS: Based on the amount of glyphosate required to kill50%of the plants (LD50), GR lines were 4–9-fold more resistant than S plants and accumulated less shikimate after glyphosate treatment. GR and S lines did not differ in glyphosate absorption, translocation or metabolism. A different target-site mutation was found in each of two of the GR lines corresponding to Pro106Thr and Pro106 Ser substitutions; the mutations were found in different homoeologous EPSPS genes. No mutation was found in the third GR line, which exhibited 1.4-fold higher basal EPSPS activity and a fivefold greater LD50 than S plants. Quantitative RT-PCR revealed that GR lines had similar or lower EPSPS expression than S plants. CONCLUSION: It is demonstrated that individuals with different glyphosate resistance mechanisms can coexist in the same population, individuals from different populations may carry different resistance mechanisms and different mechanisms can act in concert within single E. colona plants. However, other plant factors or resistance mechanisms appear to modulate plant expression of EPSPS sensitivity to glyphosate. Elahifard, E. ; Ghanbari, A. ; Mohassel, M. H. R. ; Zand, E. ; Kakhki, A. M. ; Abbaspoor, M.. 2013. Measuring chlorophyll fluorescence parameters for rapid detection of ametryn resistant junglerice [Echinochloa colona (L.) Link.]. Plant Knowledge Journal 2 : 76 - 82. Measuring chlorophyll fluorescence is a rapid and noninvasive technique for assaying photosynthetic apparatus status in plants. Chlorophyll fluorescence measurements were performed in greenhouse to characterize how the fluorescence induction curve (Kautsky curve) and its parameters were affected by ametryn (a PSII inhibiting herbicide) in R- and S-junglerice biotypes. The experiment was conducted in a completely randomized design with four replications. The maximum quantum efficiency of PSII photochemistry (Fv/Fm), the relative changes at J step (Fvj) and the area between the Kautsky curve and maximum fluorescence (Fm) (Area) of S-biotype decreased dramatically at much lower doses (100 g ai ha-1) than in the R-biotype at 4 HAS. The R-biotype showed decrease in the fluorescence parameters only at high concentration of ametryn at the same time. There were positive significant correlation between Fvj taken at 4 HAS and fresh weight taken 28 DAS of the R- and S-biotypes as 0.71 and 0.86, respectively (p≤0.01). The chlorophyll fluorescence parameters are suitable and practical indicators for monitoring photosynthesis inhibition; also, they could be useful in detecting biotypes showing resistance to PSII-inhibiting herbicides..
Thornby, D. ; Werth, J. ; Walker, S.. 2013. Managing glyphosate resistance in Australian cotton farming: modelling shows how to delay evolution and maintain long-term population control. Crop & Pasture Science 64 : 780 - 790. Glyphosate resistance is a rapidly developing threat to profitability in Australian cotton farming. Resistance causes an immediate reduction in the effectiveness of in-crop weed control in glyphosate-resistant transgenic cotton and summer fallows. Although strategies for delaying glyphosate resistance and those for managing resistant populations are qualitatively similar, the longer resistance can be delayed, the longer cotton growers will have choice over which tactics to apply and when to apply them. Effective strategies to avoid, delay, and manage resistance are thus of substantial value. We used a model of glyphosate resistance dynamics to perform simulations of resistance evolution in Sonchus oleraceus (common sowthistle) and Echinochloa colona (awnless barnyard grass) under a range of resistance prevention, delaying, and management strategies. From these simulations, we identified several elements that could contribute to effective glyphosate resistance prevention and management strategies. (i) Controlling glyphosate survivors is the most robust approach to delaying or preventing resistance. High-efficacy, high-frequency survivor control almost doubled the useful lifespan of glyphosate from 13 to 25 years even with glyphosate alone used in summer fallows. (ii) Two non-glyphosate tactics in-crop plus two in-summer fallows is the minimum intervention required for long-term delays in resistance evolution. (iii) Pre-emergence herbicides are important, but should be backed up with non-glyphosate knockdowns and strategic tillage; replacing a late-season, pre-emergence herbicide with inter-row tillage was predicted to delay glyphosate resistance by 4 years in awnless barnyard grass. (iv) Weed species' ecological characteristics, particularly seed bank dynamics, have an impact on the effectiveness of resistance strategies; S. oleraceus, because of its propensity to emerge year-round, was less exposed to selection with glyphosate than E. colona, resulting in an extra 5 years of glyphosate usefulness (18 v. 13 years) even in the most rapid cases of resistance evolution. Delaying tactics are thus available that can provide some or many years of continued glyphosate efficacy. If glyphosate-resistant cotton cropping is to remain profitable in Australian farming systems in the long-term, however, growers must adapt to the probability that they will have to deal with summer weeds that are no longer susceptible to glyphosate. Robust resistance management systems will need to include a diversity of weed control options, used appropriately..
Werth, J. ; Boucher, L. ; Thornby, D. ; Walker, S. ; Charles, G.. 2013. Changes in weed species since the introduction of glyphosate-resistant cotton. Crop & Pasture Science 64 : 791 - 798. Weed management practices in cotton systems that were based on frequent cultivation, residual herbicides, and some post-emergent herbicides have changed. The ability to use glyphosate as a knockdown before planting, in shielded sprayers, and now over-the-top in glyphosate-tolerant cotton has seen a significant reduction in the use of residual herbicides and cultivation. Glyphosate is now the dominant herbicide in both crop and fallow. This reliance increases the risk of shifts to glyphosate-tolerant species and the evolution of glyphosate-resistant weeds. Four surveys were undertaken in the 2008-09 and 2010-11 seasons. Surveys were conducted at the start of the summer cropping season (November-December) and at the end of the same season (March-April). Fifty fields previously surveyed in irrigated and non-irrigated cotton systems were re-surveyed. A major species shift towards Conyza bonariensis was observed. There was also a minor increase in the prevalence of Sonchus oleraceus. Several species were still present at the end of the season, indicating either poor control and/or late-season germinations. These included C. bonariensis, S. oleraceus, Hibiscus verdcourtii and Hibiscus tridactylites, Echinochloa colona, Convolvulus sp., Ipomea lonchophylla, Chamaesyce drummondii, Cullen sp., Amaranthus macrocarpus, and Chloris virgata. These species, with the exception of E. colona, H. verdcourtii, and H. tridactylites, have tolerance to glyphosate and therefore are likely candidates to either remain or increase in dominance in a glyphosate-based system..